Co-chairman Ban, also the Honorary President of Korea Scout Association, delivered a speech to the youth from all around the world at the opening ceremony of the 5th International Patrol Jamboree held in Gosung, Korea on August 2-7 in 2018. With the theme “Unified Dream,” the International Patrol Jamboree hosted around 6,500 international students and leaders from 45 countries. During the 6 days of the international jamboree, young global leaders camped together, exchanged different cultures, and built up their adventurous spirit. The jamboree was held in celebration of Korea hosting the 25th World Scout Jamboree in Saemangeum where around 50,000 participants from 160 countries will join in 2023. 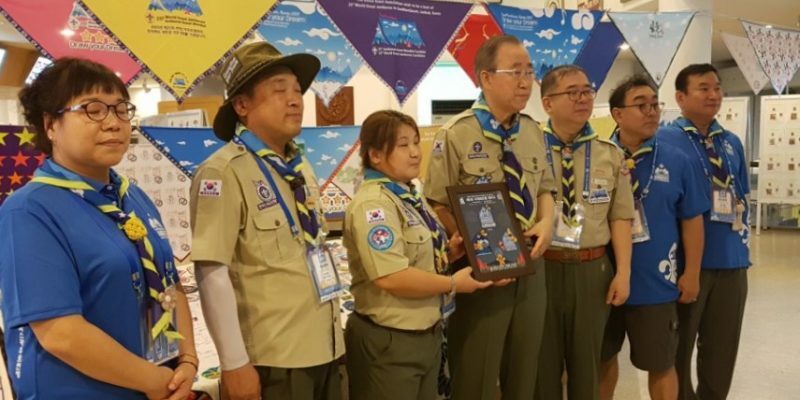 Announcing the news, Honorary President of Korea Scout Association Ban discussed measures to host the World Scout Jamboree and urged more supports for the Scout activities of the youth.